Ikirezi's eucalyptus oil is 100% pure. Wholly derived from Eucalyptus globulus, eucalyptus essential oil is extracted from fresh and mature leaves through the process of steam distillation. ρ -cymene, γ -terpinene and α -phelladrene. Eucalyptus globulus is one of the world’s most familiar essential oils and is widely known to help with respiratory problems. Traditionally, the antiseptic leaves were burned to fumigate the sick and the vapours inhaled for the relief of asthma, colds and fever. Infusions were taken internally for stomach upsets, and the fresh leaves were applied directly to ease joint pain and speed up the healing of cuts, wounds and infections. Early Australian settlers named E. globulus the ‘fever tree’ because of its efficacy in treating septic and typhoid fever. 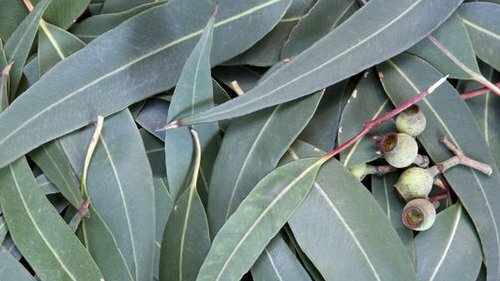 As soon as this species of eucalyptus essential oil became available in Europe it was used to treat asthma, bronchitis, croup, fevers and febrile conditions, pulmonary tuberculosis, scarlet fever, sore throats, whooping-cough, and even diphtheria and typhoid. Eucalyptus oil is very helpful when used to treat headaches, fevers, ailments of the respiratory tract, muscular aches and pains and in skin care. It has a soothing and calming effect on the whole body and helps boost the immune system. The oil is also effective against bacteria - especially staphylococci, and has a refreshing and stimulating action on the mind, helping to improve concentration. Burners and vaporizers: in vapor therapy, eucalyptus oil may be used for: frequent sneezing, hay fever, flu, respiratory problems, as an insect repellent, headaches and for helping to improve concentration. Blended massage oil or in the bath: eucalyptus oil can be used in blended massage oil, or diluted in the bath, to assist with arthritis, asthma, bronchitis, mucous congestion, colds, headaches, rheumatism, sinusitis, catarrh, fatigue and muscular aches and pains. In a cream or lotion: apart from giving pain relief to muscular spasms and rheumatism, eucalyptus oil can also help speed up the healing of slow healing wounds and ulcers, calm skin eruptions and clear congested skin. Used neat or dab on with a bud: eucalyptus oil can be used neat on the skin for insect bites or wounds, but care should be taken when doing so. Gargle: when very diluted eucalyptus oil is added to a gargle, so it can be used for soothing a sore throat. Ikirezi Natural Products is a community-interest business that produces high quality essential oils for local and international markets. Our vision is to be a leading supplier of essential oils and other natural plant products that maximizes profits to small farmers, holistically transforms communities, and strengthens agri-business in Rwanda. © 2017 Ikirezi Natural Products. All rights reserved.